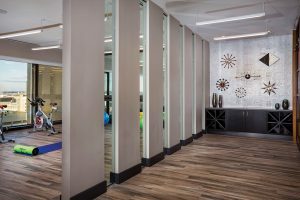 There are a ton of practical workouts you can do in this fanciful fitness space at the 2Hopkins’ apartments in Downtown Baltimore. We all know that Baltimore is a foodie city. There are a thousand delectable places to eat, but with the wind off the harbor and a colder winter season than usual, you can’t seem to find one place to burn off the extra calories. Well, the search is over. 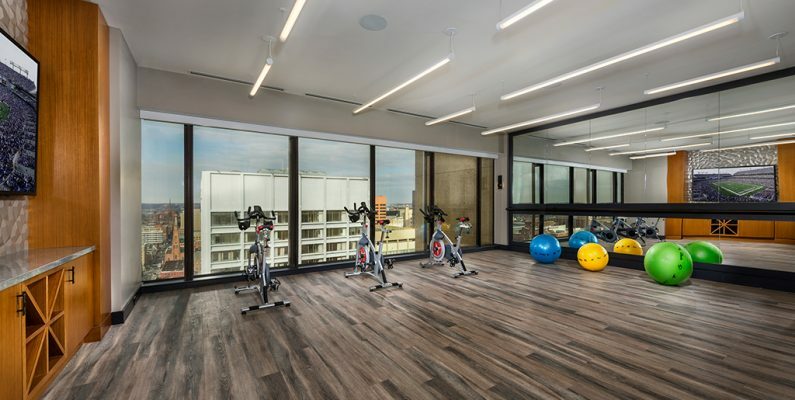 Introduce yourself to the high-rise gym at 2Hopkins’ apartments in Downtown Baltimore. 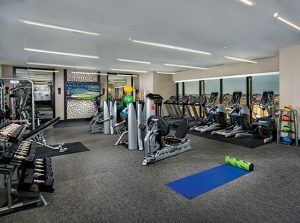 It’s a beautifully delineated space, with sweeping views of the city below to distract you from your aching muscles and inspire you to run the town. The fully equipped gym provides free-weights, medicine and exercise balls, yoga mats, weight machines, bicycles, and ellipticals. It’s quite a list. But we’ll show you how to use each to the best advantage. Look beyond the steadfast treadmill and find your new favorite workout at 2Hopkins’ Downtown Baltimore apartments. Although yoga is often seen as relaxing, on a par with meditation, people with a regular practice can attest to the shaking and sweat it produces. Take a deep breath and prepare yourself for this power yoga workout. Bonus: This workout comes with its own warm-up and cool-down, so you can avoid injuries and minimize soreness. This is a tricky fitness tool. Setting aside the risk of dropping it on your foot or throwing it too hard at your partner (like some of us have done…), medicine balls are open to interpretation. Unlike weight machines, medicine balls are incredibly flexible. You can use a variety of weights and sizes to do a hundred different movements. To cut through the mess, we suggest this simple routine. Although it’s couched as a core workout, the moves actually engage the full body. If you’re looking to improve your balance and coordination, people are more likely to recommend runs and footwork exercises than they are free-weights. But this might be overlooking one fundamental truth of free-weight lifting: you have total control over the movement. When done slowly and precisely, weight lifting can not only increase your muscle mass but also increase your balance and coordination as you control the direction and speed of your movements. That said, there’s a reason why all gyms include weight and cardio machines. For the more foodie and less coordinated of us, these machines can ensure our safety and save us some embarrassment. Machines are also great for those who’ve moved onto weights heavier than free-lifting allows or who’ve recently suffered an injury. The fitness center at 2Hopkins offers something for everyone. And it’s just one of the amazing amenities available at these Baltimore apartments. Take a tour today and see the stunning view for yourself.